I’m in Ontariariario until next week. On Friday, I’ll be heading to Toronto and, among other things, I’m looking forward to spending some time at the Ontario Library Association’s SuperConference. Come see me there at noon on January 30th whe n I’ll be chatting with some of my favorite people -- librarians -- and signing copies of Death Was in the Picture. More dates as things firm up, although I know for sure I’ll be at Seattle Mystery Bookshop at noon on Saturday February 21st, although that seems a long way off right now! 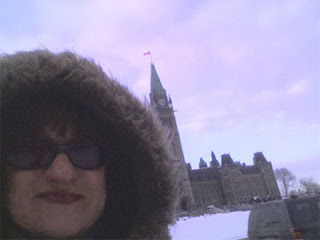 Tomorrow I’m looking forward to lunch with my friend the esteemed Ottawa-based author Mary Jane Maffini (The Cluttered Corpse) and then a visit to Prime Crime, the city’s famous mystery bookstore. If you don’t hear from me for a while, I’m maybe just stuck in a snowbank, probably with a big ol’ grin on my face. More tales from the road soon. I hope. I hope to see you in Toronto, Linda. Will you be stopping in at Sleuth of Baker Street Books? Yeah, I know: I was starstruck and for a moment forgot about author and intellectual Michael Ignatieff. So what do we call Dion now? What, John: best not answer that!